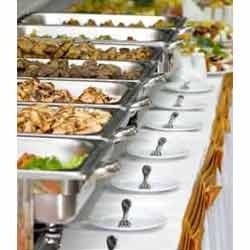 We specialize in offering top-class Outdoor Catering Services that are highly demanded in Wedding, Theme Party, Corporate Party, Reception and Cocktail party. Different food varieties are available in traditional as well as other cuisines. Moreover, we also customize the services according to our customers’ requirements. Backed by a crew of dexterous and skilled professionals, our organization is occupied in offering outstanding quality Catering Services. Our services are performed with incredible confidence and will surely make all the important occasions of your life memorable and a cheerful experience. We have a centralized kitchen having extensive working space together with adequate supply of natural air, light and water. In our service range, we offer Corporate Caterers, Industrial Caterer, Party Caterer, Marriage Caterer, Food Court, Hospitality Service, Business Lunch, Institutional Caterers, Birthday Caterer, Outdoor Caterer, South Indian Food Caterer and Homely Food Caterer. This kitchen is stretched over a large area and has the amenities to organize finest quality meals. Our food preparation amenities are superb while we are continuously working towards making it more and more capable. We are looking for queries from Chennai. These days, People are paying attention to try out numerous cuisines and the custom of serving multitude cuisines. In order to fulfill the specific requirement, we have preserved retained cooking teams to prepare pleasing and apt multi cuisine taste. We have an enormous base of satisfied customers which includes Virtusa, Zoho Development Centre India P Ltd., G.E.T. Power Pvt. Ltd, Akshaya P Ltd., etc. We are offering these services to the customers at pocket friendly price range.